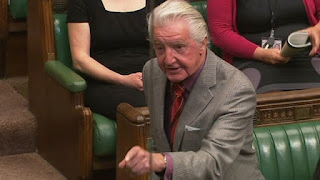 Mark Thompson: Is Dennis Skinner the real face of the Labour Party? It is a wing of the party that the government will be beholden to if the Conservatives ever win a slender majority. Not something you will ever have a problem with, and shouldn't that tell you something. Doesn't the fact that you have never ever come close to convincing enough people to get you remotely close to power in your own right tell you that you leave something to be desired? There were 42 sensible ideas. We should adopt the lot in law.